Observations by Lieutenant Colonel Grant "Gary" Jacobsen, USMC, commanding officer of 7th Communication Battalion on Okinawa from 1981 to 1982. I arrived on Okinawa on Oct. 5, 1981 and immediately assumed command of the 7th Communication Battalion, 3d Marine Division, at Camp Hansen on Okinawa. 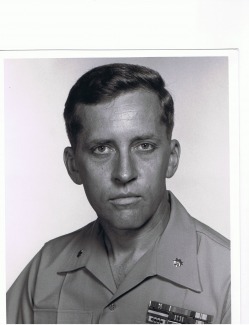 In the following paragraphs I will describe the successes and failures I experienced in that position until July 25, 1982, when my tour was cut short so that I could be re-assigned to the Command, Control and Communications (C3) Directorate in the Joint Staff. Major Bill Maupin took over the battalion until my replacement, LtCol Walker "Marty" Lazar, arrived. My first impression of the battalion was not favorable. My predecessor had stressed training and deployments to the extent that much of the communications equipment and the motor transport assets that were used to move the equipment were worn out. The rolling stock was in particularly bad shape: most of the trucks had bald tires and worn-out brakes. In short, the battalion was not combat ready. The 600 or so officers and enlisted personnel in the command seemed to lack a sense of direction and purpose. Officers' school. Every Friday afternoon the officers would gather in a conference room at the Officers' Club for professional training. My rule was simple: each officer in the command would give a one-hour presentation to the other officers on a topic that would help them professionally. Senior officers would be first, and later presentations would be in reverse order of rank. I was first. My presentation was on the Marine Corps Manual. Enhance the status of company commanders. I tried to give the company commanders wide latitude in accomplishing their missions. Also, without denigrating the status of staff officers, I held commanders-only meetings every week, and sometimes more frequently. The main entranceway to the battalion headquarters had a large board upon which were affixed photos of all the staff officers. I had those photos taken down and replaced with 8.5 x 11 photos of the battalion commander and sergeant major, plus 8.5 x 11 photos of the three company commanders along with their first sergeants. There was no longer any room for the S-1, S-3, S-4, adjutant and others. Get equipment fixed. I told my company commanders to de-emphasize training and deployments and substitute equipment rehabilitation. Jeeps, trucks and communications equipment that were not absolutely necessary were to be serviced, inventoried and placed in the Combat-Ready Storage Program (CRSP). The unacceptable alternative was to keep vehicles in the motor pool area, where they would get dirty, rusty and "lose parts." Revise the budget. In conjunction with the company commanders and the supply officer, I determined that the annual operations and maintenance (O&M) budget was inadequate. At least another $50,000 would be required in the short term--maybe more later. I documented my requirements and went to see the 3rd Marine Division supply officer--a colonel--who doubled as the division fiscal officer. He was both stunned and angry. He said more money was not available, but I knew better. In my four years at Headquarters Marine Corps (HQMC) I learned all about appropriation withholds, mid-year reviews and other accounting gimmicks. I politely told the colonel that the money was needed for combat-essential equipment and that HQMC would not look favorably on units that were not ready to go to war. The colonel scowled and told me that I would have to "see the man" (the division commander) if I insisted on getting more money. I said I was ready. Three days later he gave me all the extra money I had requested. Inspections would be learning experiences. In previous assignments, I learned that company-grade officers were clueless when it came to inspecting uniforms and personal equipment (782 gear). That was certainly true at 7th Comm Bn. Thus, whenever I held battalion-level inspections, I made it a point to explain in detail how uniforms should fit and how they can be altered. Most of the junior Marines had put on 15 or 20 pounds since boot camp, a fact that was apparent when they tried to squeeze into uniforms that no longer fit. Company-grade officers, together with their non-commissioned officers, were responsible for correcting that situation on a regular basis, not just when inspections were held. Name tapes on field jackets. Field jackets were unit (battalion) property, not the personal clothing of officers or enlisted personnel. Thus I instituted a policy that all field jackets had to have an embroidered name tape placed above the left breast pocket. My reasoning was simple--that was the only way to minimize theft while holding individuals personally accountable for the condition of the jackets. Without name tapes, as an example, there was pandemonium at the dining facility when hundreds of Marines hung up jackets and then tried to find the right one at the conclusion of the meal. Some of the "old salts" in the battalion resisted this policy, saying it made them look "like the Army." Interestingly, all Marines nowadays have embroidered name tapes on both utility uniforms and field jackets. My officers. I was genuinely impressed with the quality of the officers who served in the battalion. Most intuitively understood the problems facing the battalion and the priorities we all had to recognize. My executive officer and S-4, both majors, were solid assets to the battalion; accordingly, I tried to give them wide latitude in how they did their jobs. Failings. I did not accomplish all the objectives that I had set out for myself. They fell into the categories of discipline and rewards. In the area of discipline, I should have moved more decisively when officers did not meet appropriate standards. The adjutant that I inherited from the previous battalion commander was unsatisfactory in many ways. He had dissolute personal habits and was of poor moral character. I finally had to replace him after he falsified a rifle inventory while serving as Officer of the Day. I should've referred him to the division commander for a letter of reprimand, but I let it go. The personnel officer that I inherited--a woman Marine--drank to excess and was generally incompetent in her job. On one occasion she signed off on unit diary entries that gave ComRats (extra money) to undeserving junior enlisted men. She signed important official documents without reading or understanding them. I had to put up with her for only a couple of months, after which she was transferred stateside. I learned later that she was passed over for captain by a promotion board. Her replacement, interestingly, was the grand-daughter of a former Marine Commandant. She was, by any standard, first-rate. Rewards. I wanted very much to give out two Navy Achievement medals each month to deserving junior enlisted Marines and junior officers. Getting the paperwork together each month, however, was almost too big of a task for my new adjutant, who had the collateral duty of battalion awards officer. In the end, I awarded only about half of the medals I was authorized to give out. My tour rolled to an end on July 25, 1982. I am hopeful that I left the battalion in better shape than it was in when I arrived. I guess I did most things right, because I was promoted to colonel on July 1, 1985. Of all the assignments I had in the Marine Corps in 20+ years of service, being a battalion commander was the best. Would you like to add comments? Click on the tab at the top of this page. Semper Fi.